Browser functionality has expanded rapidly, way beyond merely “browsing” a document. Recently, Web browsers finally gained audio processing abilities with the Web Audio API. It is powerful to the point of building serious music applications. Not only that, but it is also very interesting when combined with other APIs. One of these APIs is getUserMedia(), which allows us to capture audio and/or video from the local PC’s microphone / camera devices. Whiteboard Drum (code on GitHub) is a music application, and a great example of what can be achieved using Web Audio API and getUserMedia(). 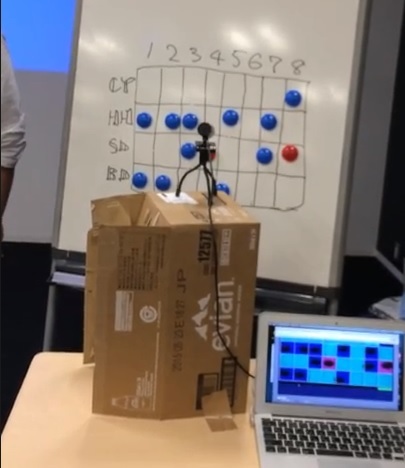 I demonstrated Whiteboard Drum at the Web Music Hackathon Tokyo in October. 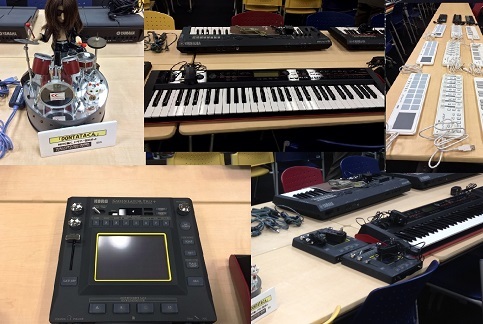 It was a very exciting event on the subject of Web Audio API and Web MIDI API. Many instruments can collaborate with the browser, and it can also create new interfaces to the real world. 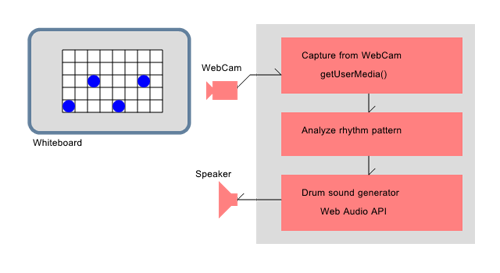 I believe this suggests further possibilities of Web-based music applications, especially using Web Audio API in conjunction with other APIs. Let’s explain how the key features of Whiteboard Drum work, showing relevant code fragments as we go. As you can see, Whiteboard Drum plays a rhythm according to the matrix pattern on the whiteboard. The whiteboard has no magic; it just needs to be pointed at by a WebCam. Though I used magnets in the demo, you can draw the markers using pen if you wish. Each row represents the corresponding instruments of Cymbal, Hi-Hat, Snare-Drum and Bass-Drum, and each column represents timing steps. In this implementation, the sequence has 8 steps. The color blue will activate the grid normally, and the red will activate with accent. Although it uses nascent browser technologies, each process itself is not so complicated. Some key points are described below. Because pixel-by-pixel processing is needed later in this application, the captured image’s resolution is reduced to 400 x 200px; that means one rhythm grid is 50 x 50 px in the rhythm pattern matrix. The video from the WebCam will be drawn onto the canvas at periodic intervals. Next, we need to get the 400 x 200 pixel values with getImageData(). The analyzing phase analyses the 400 x 200 image data in an 8 x 4 matrix rhythm pattern, where a single matrix grid is 50 x 50 px. All necessary input data is stored in the imgdatcapture.data array in RGBA format, 4 elements per pixel. This is honest pixel-by-pixel analysis of grid-by-grid loops. In this implementation, the analysis is done for the luminance and redness. If the grid is “dark”, the grid is activated; if it is red, it should be accented. The luminance calculation uses a simplified matrix — R * 3 + G * 6 + B — that will get ten times the value – meaning – which means getting the value of range 0 to 2550 for each pixel. And the redness R – B is a experimental value because all that is required is a decision of Red or Blue. The result is stored in the rhythmpat array, with a value of 0 for nothing, 1 for blue or 2 for red. Because the Web Audio API is a very cutting edge technology, it is not yet supported by every web browser. Currently, Google Chrome/Safari/Webkit-based Opera and Firefox (25 or later) support this API. Note: Firefox 25 is the latest version released at the end of October. For other web browsers, I have developed a polyfill that falls back to Flash: WAAPISim, available on GitHub. It provides almost all functions of the Web Audio API to unsupported browsers, for example Internet Explorer. Web Audio API is a large scale specification, but in our case, the sound generation part requires just a very simple use of the Web Audio API: load one sound for each instrument and trigger them at the right times. First we create an audio context, taking care of vendor prefixes in the process. Prefixes currently used are webkit or no prefix. The Web Audio API generates sounds by routing graphs of nodes. Whiteboard Drum uses a simple graph that is accessed via AudioBufferSourceNode and GainNode. AudioBufferSourceNode play back the AudioBuffer and route to destination(output) directly (for normal *blue* sound), or route to destination via the GainNode (for accented *red* sound). Because the AudioBufferSourceNode can be used just once, it will be newly created for each trigger. Preparing the GainNode as the output point for accented sounds is done like this. All that is left to discuss is the accuracy of the playback timing, according to the rhythm pattern. Though it would be simple to keep creating the triggers with a setInterval() timer, it is not recommended. The timing can be easily messed up by any CPU load. To get accurate timing, using the time management system embedded in the Web Audio API is recommended. It calculates the when argument of the Trigger() function above. In Whiteboard Drum, this code controls the core of the functionality. nexttick contains the accurate time (in seconds) of the next step, while audioctx.currentTime is the accurate current time (again, in seconds). Thus, this routine is getting triggered every 300ms – meaning look ahead to 300ms in the future (triggered in advance while nextticktime – currenttime < 0.3). The commented console.log will print the timing margin. While this routine is called periodically, the timing is collapsed if this value is negative. Especially in music production software like DAW or VST plugins, the UI is important. Web applications do not have to emulate this exactly, but something similar would be a good idea. Fortunately, the very handy WebComponent library webaudio-controls is available, allowing us to define knobs or sliders with just a single HTML tag. NOTE: webaudio-controls uses Polymer.js, which sometimes has stability issues, causing unexpected behavior once in a while, especially when combining it with complex APIs. This is already an interesting application, but it can be improved further. Obviously the camera position adjustment is an issue. Analysis can be more smarter if it has an auto adjustment of the position (using some kind of marker? ), and adaptive color detection. Sound generation could also be improved, with more instruments, more steps and more sound effects. Whiteboard Drum is available at http://www.g200kg.com/whiteboarddrum/, and the code is on GitHub. Have a play with it and see what rhythms you can create! Great demo, this is very cool. Thanks for the thorough example. Definitely going in the next issue of RealTimeWeekly.com. Thumbs up for this demo! Awesome! It is good to have examples like this which demo these new APIs (capabilities of Browsers) which were previously only available through plugins such as Adobe Flash Player.